Hereditary spherocytosis is a familial hemolytic disorder associated with a variety of mutations that lead to defects in red blood cell membrane proteins. The name comes from presence of spherocytes in the blood. Spherocytes are small cells that lack a central pallor and appear darkly stained. It is characterized by anemia, intermittent jaundice, splenomegaly and responsiveness to splenectomy. The morphologic hallmark of hereditary spherocytosisis the microspherocyte, which is caused by loss of red blood cell membrane surface area and has abnormal osmotic fragility in vitro. Hereditary spherocytosis is the most common hereditary hemolytic anemia among people of Northern European ancestry. In the United States, the incidence is approximately 1 in 5000. However, this figure does not include asymptomatic and mild forms. The disease is prevelant world-wide. However its prevalence in other groups has not been established clearly. HS usually is transmitted as an autosomal dominant trait. Multiple generations of affected families having the mutated gene are identified. Homozygosity for this dominantly transmitted hereditary spherocytosis gene has not been identified, which suggests that the homozygous state is incompatible with life. Twenty-five percent of all newly diagnosed patients result from new mutations. Parents of these sporadic cases do not have clinical or hematologic abnormalities. An autosomal recessive mode of inheritance also occurs, accounting for 20-25% of all hereditary spherocytosis cases. It manifests only in individuals who are homozygous or compound heterozygous and often is associated with severe hemolytic anemia. Hereditary spherocytosis results from the interplay of an intact spleen and an intrinsic membrane protein defect which leads to an abnormal red blood cell. Molecular defects in the genes that code for the RBC membrane proteins spectrin (alpha and beta), ankyrin, band 3 protein, protein 4.2, etc result in cytoskeleton instability and destabilization of the lipid bilayer. This leads to loss of membrane surface area which is the major pathological feature of red blood cells in hereditary spherocytosis. Loss of membrane surface area transforms red blood cells from normal biconcave discs to spherocytic forms. These spherocytes have decreased deformability compared to normal RBCs ie. the cell’s ability to change shape when traveling through the blood vessels is reduced. When these cells pass through the spleen, they are not flexible enough to pass into the sinusoids and get entrapped within the splenic cords. The entrapped red blood cells are phagocytosed by macrophages resulting in extra vascular hemolysis. Clinical features can range from an asymptomatic condition to a severe hemolytic anemia. Patients with severe cases usually present in neonatal period, while those with mild HS may not be detected until adulthood, when an external environmental factor like fatigue, cold exposure, non specific viral infections, emotional distress, or pregnancy leads to detection of their disorder. Anemia, jaundice, and splenomegaly are the most common clinical features. Anemia may be absent, mild to moderate, or very severe. Jaundice may be severe enough so as to require exchange transfusion in the neonatal period. Jaundice is likely to be most prominent in newborns. Children diagnosed early in life usually have a severe form of HS that results in their early presentation. HS is an important cause of neonatal anemia and hyperbilirubinemia and prompt treatment is necessary to reduce the risk of kernicterus (bilirubin-induced neurologic dysfunction or BIND). Beyond the neonatal period, jaundice rarely is intense, is usually intermittent and triggered by external environmental factors. Gallstones of the pigment type (due to excess unconjugated bilirubin in bile), may be found in very young children. The incidence of gallstones increases markedly with age. History of family members with gallstones in early life (2nd or 3rd decade) is a clue to the possibility of HS or other chronic hemolytic disorder. In patients with mild hereditary spherocytosis, cholelithiasis may be the first sign of an underlying red cell disorder. Other complications of include aplastic, megaloblastic or hemolytic crisis, transfusion induced iron overload and chronic leg ulcers. An increased MCHC is a characteristic feature of RBCs cells in hereditary spherocytosis. MCHC values greater than the upper limit of normal are common. This increased MCHC is a result of mild cellular dehydration. Spherocytes are small cells that lack a central pallor and appear darkly stained. The number of spherocytes vary from patient to patient. Although a characteristic feature, spherocytes are not specific to hereditary spherocytosis. They are also seen in immunohemolytic anemias, G6PD deficiency and thermal injury. However, the spherocytes in HS are fairly uniform in size and density. Other features seen are anisocytosis, pokilocytosis and polychromatophilia. It shows hyperplasia of the erythroid cells. Bone marrow examination is not required to diagnose HS. Its only role is to rule out or confirm aplastic or hemolytic crisis. Osmotic fragility of red cells is a measure of their spheroidicity. Since spherocytes have a reduced membrane surface area relative to volume, they are unable to withstand the entry of small amounts of free water that occurs when they are placed in progressively more hypotonic solutions. As a result, they hemolyse more than the normal RBCs at any salt concentration. This hemolysis is estimated by measuring the amount of hemoglobin released from RBCs into the extracellular fluid. In this test, RBCs are exposed to a series of saline (NaCl) solutions with increasing dilution. The sooner hemolysis occurs; the greater is osmotic fragility of RBCs. The most sensitive test for HS is the incubated osmotic fragility test, which is performed after incubating RBCs for 18-24 hours at 37°C. These are done using specific radioimmunoassay to look for abnormalities in spectrin, ankyrin, band 3 or band 4.2. However, these studies are not routinely performed and are available only in select research laboratories. Measurement of Vitamin B-12 and folic acid should be done in case of megaloblastic crisis. Iron status including serum iron and serum ferritin level needs to be determined in case of history of repeated blood transfusions because of multiple hemolytic episodes. Abdominal ultrasonography should be done periodically to detect gall stones. Currently, there is no cure for the genetic defect of hereditary spherocytosis. In case of marked hemolysis or aplastic crises, RBC transfusions are often required. Neonates with severe hyperbilirubinemia caused by hereditary spherocytosis are at risk for kernicterus and should be treated with phototherapy and/or exchange transfusion. Since folic acid is required for normal erythropoiesis, patients should take supplementary folic acid (1 mg/ day) to prevent megaloblastic crisis. Splenectomy is the definitive treatment for hereditary spherocytosis. Except in the unusual autosomal recessive variant, splenectomy is permanently curative. Within few days of splenectomy, hemolysis and jaundice are eliminated. Moderate disease along with growth failure or other signs and symptoms of anemia. Splenectomy It is not indicated for mild cases. Splenectomy in children should be performed after 5 years of age, to reduce the risk of post splenectomy sepsis. Partial splenectomy is another approach in the children. This aims at retaining splenic immunologic function while at the same time reducing the rate of hemolysis. This approach is particularly useful in children less than 5 years of age who require frequent blood transfusions. Splenectomy, results in increased hemoglobin concentration, decrease in reticulocyte count and bilirubin level as well as control of symptoms. It also results in leukocytosis and thrombocytosis. 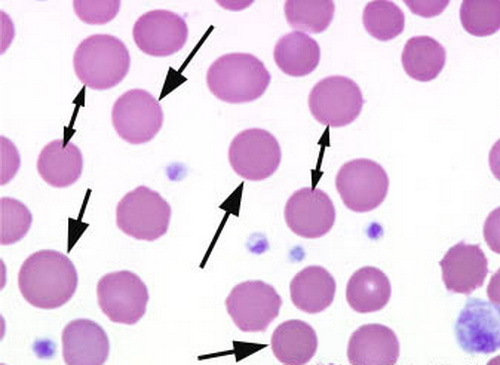 On peripheral blood smear, spherocytes are unchanged or may even increase. Fatal sepsis caused by capsulated organisms (eg, Streptococcus pneumoniae, Haemophilus influenzae) is a common complication in children who have had a splenectomy. Vaccination against pneumococcus and H influenzae must be administered to patients prior to splenectomy and to all patients with severe HS. If gallstones are detected on ultrasound examination, a prophylactic laparoscopic cholecystectomy may be performed. This helps prevent significant biliary tract disease.